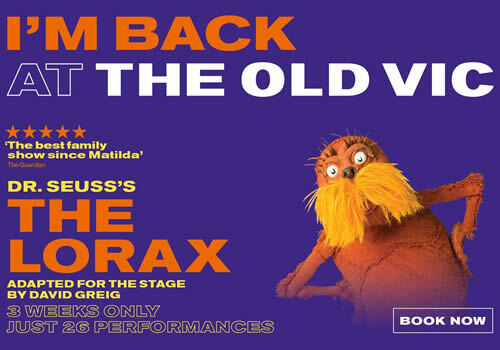 Following critical acclaim and an Olivier nomination for Best Entertainment and Family, the Old Vic bring back their popular production of Dr Seuss’s The Lorax. Playing from October 2017 as part of Matthew Warchus’ second Old Vic season, the dazzlingly funny show follows highly-anticipated Bob Dylan musical Girl From the North Country. “I am the Lorax. I speak for the trees!” Inspired by Dr Seuss’s classic children’s tale, The Lorax tells the story of a mustachioed, big-hearted, yet cantankerous critter who is anxious to save the world’s trees. This hugely funny and moving show sees greedy businessman The Once-ler confronted by the magical, irrepressible Lorax. Blending zany humour with vibrant theatrical invention, The Lorax is the perfect Christmas show. Adapted for the stage by David Greig, The Lorax features music and lyrics by Charlie Fink. A riot of colour, infectious music and a glorious message for both adults and children, the play uses puppetry to bring to life one of literacy’s favourite characters. Directed by Max Webster (James and the Giant Peach), The Lorax features choreography by Olivier Award-winning Drew McOnie, design by Rob Howell, lighting design by Jon Clark and sound design by Tom Gibbons. Playing at the Old Vic Theatre from October 15th, the magical production is set to play a limited season until November 5th 2017. The Lorax is recommended for those aged 6 and up. Please note that children under the age of 3 will not be admitted inside the auditorium.